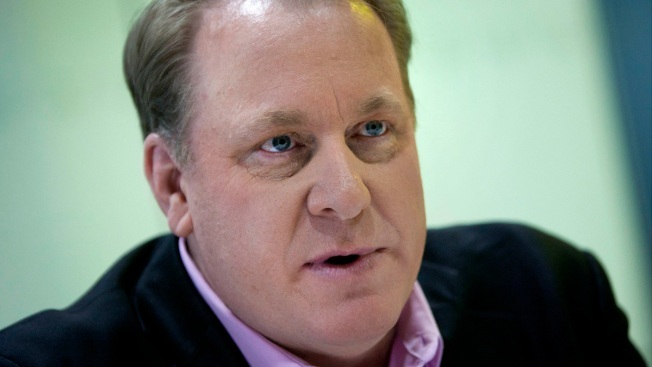 Col. Steven O'Donnell said Saturday that the possibility of criminal prosecution in the case is "still out there"
Curt Schilling, chief executive officer of 38 Studios LLC and a former Boston Red Sox pitcher, speaks during an interview in New York, U.S., on Monday, Feb. 13, 2012. 38 Studios, formerly Green Monster Games LLC, is an entertainment and intellectual property development company founded by Schilling and named for his jersey number. Rhode Island State Police officials say they are close to completing a years-long investigation into former Major League Baseball pitcher Curt Schilling's bankrupt 38 Studios. The Providence Journal reports Col. Steven O'Donnell said Saturday that the possibility of criminal prosecution in the case is "still out there." The former ballplayer's financially-beleaguered video game company received a $75 million state-backed loan in July 2010. After going under, Rhode Island taxpayers were left on the hook for tens of millions of dollars. Gov. Gina Raimondo asked O'Donnell in October to produce a report on 38 Studios regardless if criminal charges are brought as a result of the investigation. O'Donnell said he can't predict exactly how or when the state police investigation will conclude.